Microsoft officially launched Office 365 on Tuesday. Individuals and businesses of all sizes can now take advantage of the same productivity and communications platforms that have traditionally been reserved for larger companies with big budgets and IT departments. Those larger companies with big budgets and IT departments can cut costs and let Microsoft manage the back-end tedium to deliver these services. Microsoft is offering Office 365 in two basic versions: Professional and Small Business, and Medium Business and Enterprise. Regardless of which plan you get, Office 365 provides Exchange Online, Lync Online, and SharePoint Online, as well as Office Web Apps--Word, Excel, PowerPoint, and OneNote. The Professional and Small Business Plan is $6 per month per user, while the Medium Business and Enterprise plans range from $10 to $27 depending on the features and services. For example, some of the Office 365 options offer licensing for the full Microsoft Office 2010 Professional desktop software. Obviously, there are some differences among the various plans, but there are also common elements available in all of them. I have had the opportunity to work with the Office 365 beta for the past few months, including before the April release of the public beta. Based on the experience, here is my hands-on assessment of what to expect from the new Microsoft cloud productivity suite. When you log in to Office 365 you are taken to a Home page. The Home page is clean, and uncluttered--almost to the point of seeming unpolished. The Home page varies some between the Professional and Small Business version, and the Medium Business and Enterprise version of Office 365, but the basic layout and many of the elements are the same. On the Professional and Small Business Home Page, you have sections on the main screen for Outlook, Lync, Team Site refers to your SharePoint site, and Website is a link to your public Website. Across the top of the display there are links for Home, Outlook, and Team Site. At first glance that may seem redundant, but as you bounce around using the features of Office 365 these links remain as anchors to enable you to easily navigate back to other areas of the service. On the right hand there is a pane with the current day and date at the top. Beneath that is a search bar, and then a list of links to resources such as how to import your contacts into Office 365, and how to set up your Office 365 email on your mobile phone. There are also links to the Office 365 blog and community forums. Under the Outlook heading on the Office 365 Home page there are three links: Inbox, Calendar, and Options. Both the Inbox link and the Calendar link take you to the respective page of the Outlook Web App. The Outlook Web App has basically the same functionality as the desktop version of Outlook, but with the added benefit that the information can be accessed from anywhere, any time, on virtually any Web-connected device. If you click on the third link--Options--you can configure your Outlook Web App and manage your Exchange Online services. It shows how much of your mailbox storage space is currently being used, and add or remove email accounts. On the right side there is a box called 'Shortcuts to other things you can do' which includes things like 'Connect Outlook to this account', 'Change your password', or 'Import your contacts from an existing email account'. It would be handy if Office 365 could simply sync or import contacts directly from an existing Outlook PST file, but you have to first export your contacts to a CSV file--and before you can do that you have to find the Export feature which is buried in Outlook 2010 under File -- Options -- Advanced. It is not the most intuitive process. On the left side of the Outlook Web Apps options, there are links to enable you to configure and manage other aspects of your account. It's possible to set Inbox rules to filter email, and you can establish Retention Policies to automatically remove or archive old messages to keep the size of your mail file under control. You can also set standard Outlook settings like whether or not to show the Bcc field, or what the default reminder timeframe is for calendar events. Clicking Phone in the left pane lets you manage the phones associated with your Exchange Online and Outlook account. You can remove a device so it no longer has access, view the device recovery password, initiate a device wipe to erase data, or block your phone from accessing Exchange Online if it is lost or stolen. The only option under Lync on the Office 365 Home page is to install Lync 2010. As the link implies, clicking on it will download and install the Lync 2010 client software. Lync is a very versatile tool, and one that most individuals and small businesses haven't had the luxury of using. Lync combines instant messaging, audio/video calls, and online meetings with real-time presence to deliver a powerful communications tool. The Lync client displays your contacts from within your Office 365 domain, and it can also connect with Windows Live Messenger. You can instantly see which contacts are online, and whether or not they are currently available. One click lets you instant-message a colleague. You can add additional peers to the conversation, switch to a video conference, and share your desktop with the whole group all from within Lync. There is a bit of a culture shift that has to occur, but once you get comfortable with Lync, it will be one of your most used tools. By connecting your Office 365 with partner, vendor, or customer Office 365 accounts, or by networking through Windows Live Messenger, Lync enables you to communicate more efficiently and more effectively. There are Office Web App versions of Word, Excel, PowerPoint, and OneNote. The Office Web Apps are limited versions of their Microsoft Office 2010 desktop versions. The Web versions have most of the common features and functions, though, so they will work just fine for most users. Despite having fewer bells and whistles, the Office Web Apps have two distinct advantages over their Office 2010 equivalents: availability and collaboration. Because the tools are based on the Web, they can be accessed from anywhere, and can even be accessed from smartphones and tablets--although my experience trying to use Office Web Apps, or even to view files already created with Office Web Apps from an iPhone or iPad proved to be a failure. If you have a Windows Phone 7 smartphone--especially one with the Mango updates--the Office mobile experience is much more streamlined. Windows Phone 7 integrates seamlessly with Microsoft Office files stored online in either SharePoint or SkyDrive, and it has native Office Mobile Apps rather than relying on the Office Web Apps. I haven't worked with Mango, but I had an opportunity to work with Windows Phone 7 for a few weeks and it was a vastly superior experience for users who operate in a Microsoft-centric world. As long as you are on a Web-connected device that plays nice with Office Web Apps, though, you can also share files with peers, partners, or customers. This is great for very large documents because it saves time and bandwidth over trying to email it as a file attachment. 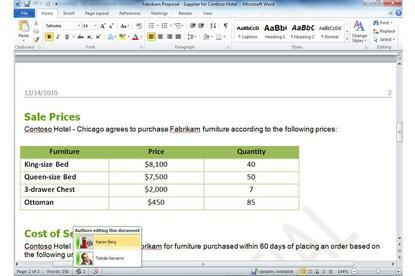 For Excel and OneNote, you're able to collaborate online with others that the file is shared out to, and see edits and changes in real-time. Another benefit of Office Web Apps is that files are saved in the same XML-based format as Microsoft Office desktop files. That means that the files created with Office Web Apps can be easily shared with and edited by partners or customers without impacting the formatting as the file moves from Web to desktop, and back to the Web. Like Lync, SharePoint is another powerful Microsoft tool that most individuals and small businesses have been unable to take advantage of. SharePoint is more a platform than an application, and it has many potential uses. SharePoint is your Team Site. It is like a combination Intranet site and file storage repository. You can create folders and save files on the Team Site, post messages to the team. If you choose to, though, the SharePoint team site can also be much more. For example, SharePoint can also be an online platform for collaboration--enabling teams to work together in real-time on documents. Click on the Website link lets you create a professional looking site with a few clicks. That includes making an About Us, Contact Us, Home, and Site Map page, customizing the look and feel with themes and templates, then making the site available to the public. Office 365 also comes with some peace of mind. Data is stored on redundant servers, scattered across geographically diverse data centers with automatic failover. Your data is backed up and protected against disasters. In addition, Office 365 provides Microsoft Forefront Online for Exchange security that weeds out malware and spam from your email. Finally, Microsoft is guaranteeing 99.9 percent uptime, and backing it with a guarantee. All in all, Microsoft is offering a lot of bang for the buck with Office 365, and customers can take advantage of the tools and services while leaving the maintenance and administration headaches to Microsoft.